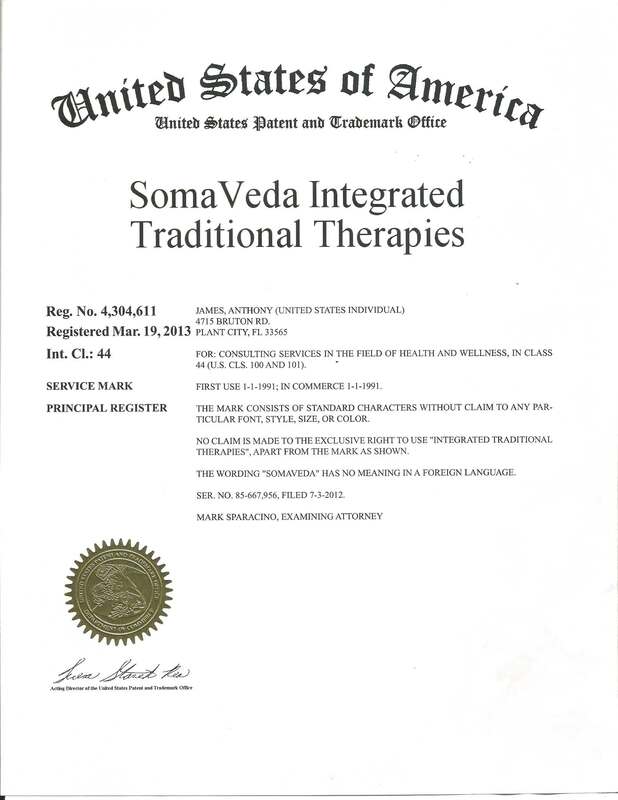 SomaVeda Integrated Traditional Therapies®, SomaVeda®, Somaveda® Thai Yoga are registered and exclusive trademarks of Anthony B. James. The SomaVeda® Thai Yoga system, contents, flows, vinyasa, Therapeutic Day Protocol etc. are intellectual property developed over time and at great expense of the Trademark owner. SomaVeda® Student/ members completing training (s) may use the trademarks in a limited fashion, with permission for the purpose of private practice and consultation, however, in every case are strictly forbidden from teaching, instructing or giving certification or using derivatives of SomaVeda® proprietary therapeutic techniques, course materials, flows, forms, vinyaysa, therapeutic protocols and or any methodologies provided in our classes without permission. Especially this includes changing the name or “personalizing” in an effort to avoid Trademark recognition and violation. Additional copyright protections extend to all class materials both public and privately published. All SomaVeda® participant, certificate course attendees, students, graduates etc. agree to not teach or give certifications of any kind based on SomaVeda® System until and unless licensed to do so. This Registered Trademark violation prohibition includes teaching for hire for third party organizations and or unauthorized schools or programs. If found in violation, violators will be fined a minimum $10,000 fine per individual violation plus attorneys fees within 10 days of notice of such violation. Every individual enrolled in a violators program will be termed an individual violation. The remedies for infringement under the Lanham Act are statutory and consist of: injunctive relief; an accounting for profits; damages, including the possibility of treble damages when appropriate; attorney’s fees in “exceptional cases;” and costs. See 15 U.S.C. § 1117. These remedies are cumulative, meaning that a successful plaintiff may recover the defendant’s profits in addition to any damages, or other remedies awarded. SomaVeda® Trademark, Intellectual Property and or Copyright Infringement violations of any kind will be prosecuted both criminally and civilly to the full force and penalty afforded by law. 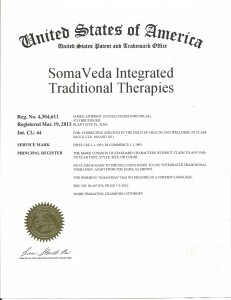 All SomaVeda® publications, materials, content, instructional aids, lists, forms, specific sequences, flows, vinyasa, therapeutic protocols including but not limited to the SomaVeda® Therapeutic Day Clinical program, books, audio, visual aids are the exclusive, proprietary and protected intellectual property of Anthony B. James. No part of the SomaVeda® Copyrighted © content or intellectual property of Anthony B. James may be copied, excerpted, duplication by any means, either by conventional , digital or electronic means in any fashion whatsoever without the expressed written permission of the author an IP Rights owner. All World Rights Reserved.